Over the past two years I’ve been working closely within the library community about digital content for children. I’ve attended conferences, participated in the brilliant @LittleeLit think tank and even co-created training modules to pilot for professional development in multiple states. But until this past month, after attending the exceptional American Library Association (ALA) 2014 annual conference in Las Vegas, I worried that librarians would not catch up in time. I feared that the digital shift towards apps, tablets, gamification, transmedia storytelling and new media formats was simply moving too fast. For the first few years after the iPad arrived, it seemed possible that the library community may have gotten on board a little too late to be at the front of this crazy digital train. Boy, was I wrong! I began the week-long conference with a professional development training for public librarians who serve the Las Vegas area. Cen Campbell, founder of LittleeLit, and I presented a two-hour orientation to the digital shift and new media for the children’s librarians at the Las Vegas-Clark County Public Library District (LVCCPLD), highlighting the main topics we cover in our 24-unit-hour program that we have been piloting in Southern California. This evolving curriculum has been made possible by the foresight and support of the California State Library. On Thursday, things began to heat up (and in Vegas this means both literal and figurative heat)! Cen and I helped Betsy Diamant-Cohen set up her booth for the exceptional infant/toddler program “Mother Goose on the Loose” which includes digital suggestions for early childhood educators and a fabulous, free app called Felt Board: Mother Goose on the Loose by Software Smoothie. The emphasis on “digital” was less alarmist overall in my experience in workshops and within the vast exhibition hall with over 5600 exhibitors, making the change since 2013 in Chicago palpable. Nearly every booth had some nod toward the digital shift, and the overall number of booths featuring eBooks, apps or other digital materials was astounding. In the summer of 2013, I spent over 24 hours trolling the exhibits in Chicago at #ALAAC13, looking for a digital or app connection and found only a few people who could speak thoughtfully about the digital transition happening to the publishing industry and even fewer who could distinguish between formats as basic as apps vs eBooks. 2014 was a refreshing change, where I found many exhibitors not only willing but eager to discuss their new media offerings. Next up, Cen introduced me to several people as they checked into the conference … including Saroj Ghoting (Early Childhood Literacy Consultant) and Jason Boog, two people I was impressed with but had never met in person. Jason’s book, Born Reading, was just published this last week, in fact. 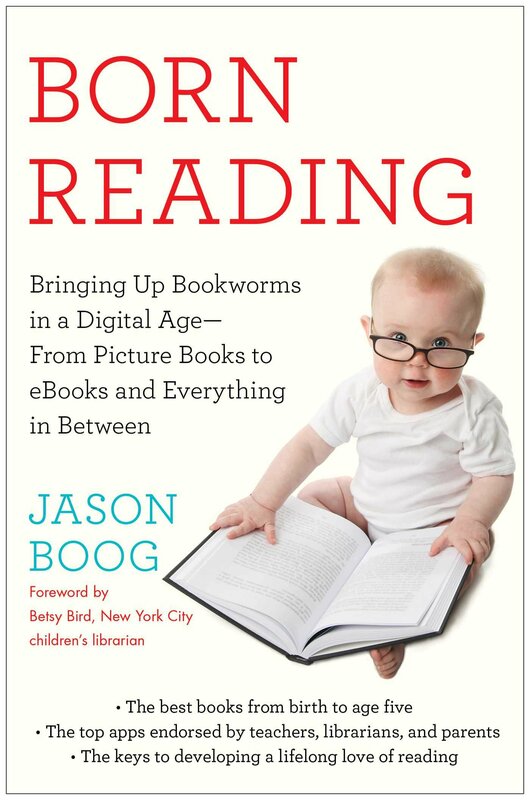 Born Reading: Bringing Up Bookworms in a Digital Age — From Picture Books to eBooks and Everything in Between is a touching memoir about a dad’s exploration of picture books and early literacy with his young daughter, filled with great research about reading to children. It includes specific tips and titles recommended in print AND digital for each age. I highly recommend it, especially to parents of young children (it would be a perfect baby gift, actually). During the weekend, I spent most of my time on presentations. I was speaking myself on Saturday, including panel presentations for The Apps are All Right! with Barbara Klipper, Cen Campbell, and Tess Prendergast, and ECRR 2.0: Using Apps and eBooks in Early Literacy Programs – Every Child Ready to Read with Tess & Cen again, along with Dr. Chip Donohue, Claire Moore, Naomi Smith, and Dr Betsy Diamant-Cohen. On Sunday I attended two additional segments from LittleeLit, including one on Diversity & Special Needs Apps and another on Rapid App Evaluations. It was exceptional to see so much energy and excitement not only about apps in general this year at ALA, but about apps in depth, as a format. The discussions were rich and thoughtful, fueling a lot of optimism about the digital shift. Among my own notes for my presentation was this one chart I will share with you here – showing the criteria for reviewing digital book apps in comparison to criteria used for traditional paper picture book evaluation. Many LittleeLit Think Tank members were presenting during the week, including several great app-themed workshops. Overall, “app” was found in 500% more workshop titles this year over last year (5 vs 25) and “book app” was present in 3 descriptions over none in 2013. There was also a nearly 150% increase in workshops with the word “eBook” (68 vs 48) since 2013. But no statistic can really portray the overall mood I detected this year. At November’s CLA conference I noted a strong interest and anxiety about the digital shift, but no more than the same feeling I had found at 2013’s summer ALA convention in Chicago. The feeling in Vegas was different. Maybe being in a city like Vegas gave everyone permission to consider things ‘outside the box’ of our usual professional construct, but then again, the hour for librarians may simply have arrived! In my estimation, librarians are the perfect ‘digital docents’ for the 21st century’s digital content. From what I’ve read, many in the field of library sciences have been fretting about where they fit into the digital shift, so the time is now to assert that librarians (as a profession) will be MORE in need by society in the future than ever before. There should be more jobs, not fewer, for library students. They are the professional and ethical curators of the digital world, essential to our cultural transition. And we couldn’t be in better hands! * All statistics about ALA Conferences taken from keyword search on the scheduler for ALA2013 and ALA2014.